I am planning a party in the wilderness, where there is no firewood. I decided to carry some firewood there, to make it more fun. It's planned for a specific day in the winter (e.g. birthday party), so there are a few months of "preparation", during which I'll visit that place a few times. How can I keep the stashed firewood dry? It's dry season now, but there will be many rainy days (however, I don't expect rain for several days in a row). There will be about 50 kg of wood. If you haul in your wood unchopped with its bark still on, then it'll stay dry enough on the inside. We found a pile of wood buried in the snow at one winter camp, and had no troubles getting a fire going with it. Don't worry too much about it getting wet; just leave it stacked in a spot where water won't accumulate. It will burn without any issue when you go to use it in the middle of winter, so long as you chop it well enough. To make things easier, bring a bottle of lighter fluid: one hot flash dries even the wettest of wood (enough for the rest to catch). For more info read the answer to the question How to light a fire with wet firewood?. First realize that firewood has two qualities when it relates to moisture. Seasoned wood that is sitting in water will get wet, and won't burn well. Much like green wood, it can burn assuming it is not waterlogged. A passing rain is not going to have a significant impact on firewood that is not laying in a puddle. Storing your fire wood for winter use. Cut and split it to length, if the bark stays on the wood leave it on (best), if not set the bark to the side. Put something down to keep the wood off the ground (foundation), such as rocks, large branches, a pallet, or a couple of pieces of firewood (set at a right angle to the stack). Stack the wood bark side up. Essentially you are building a bark roof. If the bark came off you can use it to cover the pile and a use the same type of things used for the foundation to secure the roof. For the most part the bark will shed the rain and the snow, the foundation will keep it from soaking up water, and the open ends, and splits will help it season faster. Image shows a well built wood stack. You don't really have to keep it dry at all. If it is proper firewood, it has already dried. A little rain won't change that. To start a fire you can split the wood, which will be dry inside. Once the fire has gained a little strength, you can just put the wet logs on; they will dry in no time. I can understand if you want to keep the wood from soaking through. Piling it up properly should be enough — if there is too much rain, you can just put a tarp on top of the pile. If you want to be on the safe side, and are not sure if the wood has dried properly, you could just bring some dry wood on the day of the party itself. Not much, just enough to get it started. It all could fit into one paper bag containing kindling, small branches, a few medium and one or two bigger pieces of wood. No matter how wet your stashed wood is, it will quickly dry on top of a healthy, burning fire — and again, if it is actual firewood, it should not be very wet at all. Stack the wood in a row, lying east to west (for equatorial exposure to the sun) Split wood tends to burn better than whole round pieces of branches - as splitting exposes the inner layers of the tree to air movement that aids in drying. Avoid ground contact as much as possible, as the frost may make it difficult to remove - as well the wood will absorb moisture from the ground. 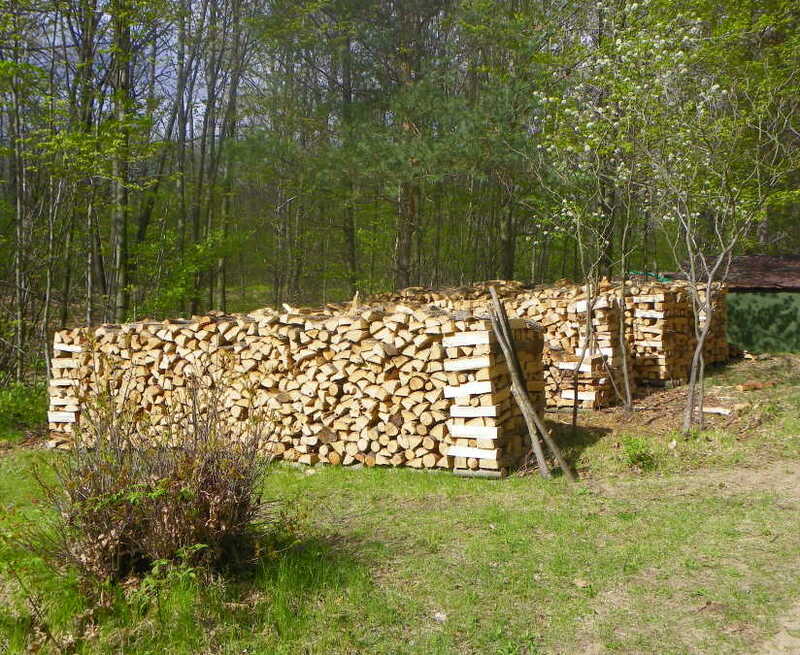 If possible, overlap some boards on top of the woodpile in order to help the pile shed water. If you can manage to bring an old pallet to the site - it would be ideal to stack the wood on. It would also be available for kindling when you start your fire. Depending on the type of wood, 50 kg of wood will take up about 0.1 m^3 when stacked. Depending on local rules, I would simply bury it in a cheap plastic tarp. Just make sure you remember the location and bring a shovel. This would be best if you can bring it all in one trip, but if not, just dig the hole deep enough for all the wood on the first load. Not the answer you're looking for? Browse other questions tagged rain firewood or ask your own question. How much wood can the average person expect to chop in a day? Suvival: logs/wood, split or not to split? Is it legal to collect firewood (to take away) from woods and forests in the UK? How to deal with hail outdoors without special equipment?